The Philadelphia Orchestra and Mendelssohn Club of Philadelphia led by Steven Reineke performing to Harry Potter and the Prisoner of Azkaban Thursday night at the Mann Center. Getting your soul sucked out by a Dementor is a noisy business. It requires nothing less than percussion, horns, and a choir locked in agonizing dissonance. Reversing the act takes some sonic power, too, and so Harry Potter and Sirius Black were fortunate to have the Philadelphia Orchestra and singers from the Mendelssohn Club of Philadelphia there Thursday night to help put things right. After all, what kind of power would the Patronus magic spell have without the ray-of-light backing of a good choir? Jason Kelce’s big debut with the Philadelphia Orchestra: Not too @#$! shabby! Harry and Sirius weren't the only lucky ones. 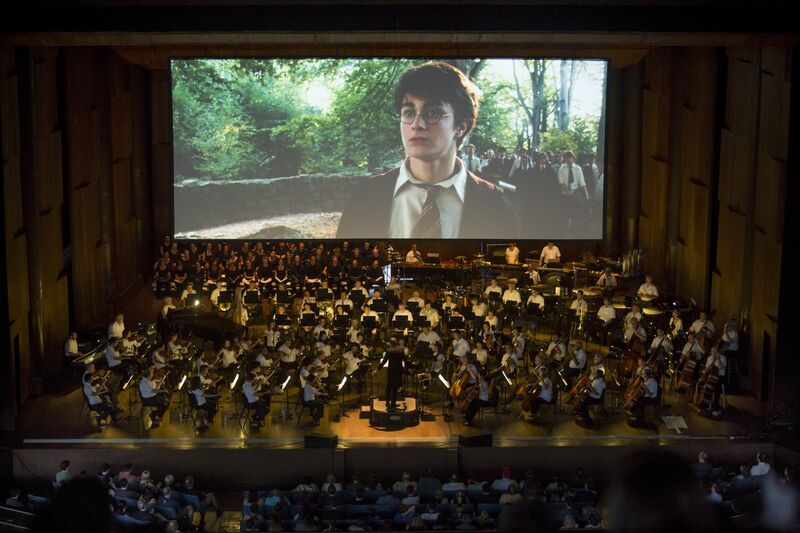 Thursday night marked the Mann Center's third annual installment in its live-orchestra-to-film Harry Potter series, and the showing of Harry Potter and the Prisoner of Azkaban drew 9,779 Potter fans into the mysterious realm of the symphony orchestra (or the other way around). Steven Reineke led John Williams' score, which is both more exotic and less comforting than the one Williams wrote for the first film, Harry Potter and the Sorcerer's Stone. It is darker, too. If Williams made us feel the rustle of an owl's flight and the boyish adrenaline of a good Quidditch match in the first film, here we sense the insistence of death as its vapors crackle everything they touch into a death-freeze. There's a suffocating power to much of this music. The orchestral palette is expanded. An early-music touch drops in for visits (two recorders are used), as does a vague British Isles folk sound by way of penny whistle solos played beautifully by Rachel Siegel. Never before has a harpsichord (actually, here synthesizer with a harpsichord patch) sounded more like it was coming up behind you with evil intent. This installment in the Potter tale takes place in year three at Hogwarts, and the ambiguities that begin surfacing in the teen years find their place in the music. When Harry rides Buckbeak, the Pegasus-like creature (but meaner), the music doesn't simply soar; it carries both freedom and terror. Unadulterated goodness does come — like in one Dementor-defeating moment for Harry when the live-orchestra presence of Peter Smith's oboe solo reassured us of the triumph of justice, at least for the moment. There were stretches, for sure, when the action of the film grabbed you so strongly that you started to forget the orchestra was there. When Hermione uses her time-turner necklace, there's not just the ticking sound that marks the race to go back in time and change the course of events. Williams also scores a ticking part for the marimba, and he stretches intermittent entrances of other instruments across the canvas of time. It created a disquieting sensation. You were barely aware of the music working your nerves. It delivered you, though, to the belief that all events are malleable, that reality exists only as you have created it. All we need to save us now is the right necklace and, perhaps, the right orchestra.